^ 1.0 1.1 1.2 1.3 1.4 Missouri River. 美国地质局地理名称信息系统. 1980-10-24 [2010-05-06]. 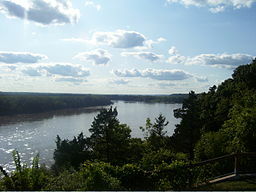 ^ Spotlight on the Big Muddy (PDF). Missouri Stream Team. [2012-01-14]. （原始内容 (PDF)存档于2011-10-17）. ^ AISRI Dictionary Database Search--prototype version. "River", Southband Pawnee. American Indian Studies Research Institute. [2012-05-26]. ^ Madison Lake. 美国地质局地理名称信息系统. 1980-04-04 [2012-01-21]. 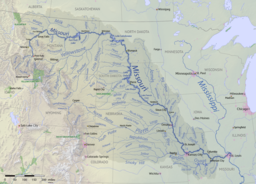 ^ Missouri River Environmental Assessment Program Summary. U.S. Geological Survey. [2010-10-08]. （原始内容存档于2010-05-27）. ^ Pinter, Nicholas; Heine, Reuben A. Hydrologic History of the Lower Missouri River. Geology Department. Southern Illinois University, Carbondale. [2010-05-08]. （原始内容存档于2011-07-23）.